Travel up the Na Pali coast on this popular Kauai snorkeling cruise with Blue Dolphin Charters. Great scuba diving and snorkeling in Kauai. Go Snorkeling in Kauai in prisine waters with spectacular fish and marine life. This is no ordinary snorkeling in Kauai tour. 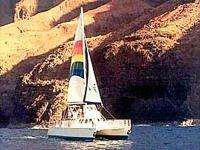 This Deluxe Na Pali Coast Hawaii snorkeling adventure includes a continental breakfast, full deli lunch and mai tais. Don't miss out on the breathtaking views of the Na Pali Coast on this great Kauai snorkeling tour. Make memories on this exciting 5 hour Hawaii snorkeling adventure. You will want to capture the Na Pali coast's beauty on film - don't forget your camera! This snorkeling in Kauai tour offers a Scuba option - 1 tank for only $35. Reserve a Hawaii Snorkeling tour at a discount with Kauai Snorkeling! Snorkeling in Kauai is a popular Hawaii activity. Let us help you find the perfect Hawaii snorkeling tour for you. Scuba divers must be twelve years and older. Scuba divers must sign a medical and liability waiver.